My old man used to label us kids as “fair-weather sailors” when we bitched about working outside during bad weather. 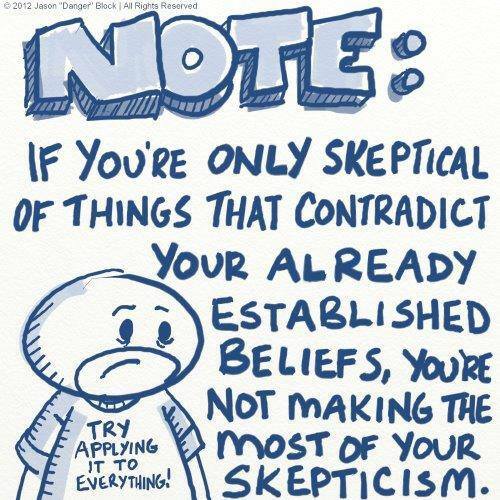 That phrase comes to my mind sometimes when I come across people who claim to be “sceptics ” (“Skeptics”) behaving very unsceptically when confronted with a claim outside their area of interest. For example, someone who can be quite objective about scientific claims but reacts quite unobjectively to political claims. Perhaps politics is a bit like religion to some people – they line up instinctively on one side or another. However, I think a true sceptic should still be able to consider political claims according to the facts available and not just rely on instincts. So, I am all for this image. Yes it is hard. But when you think about it what use are one’s ingrained prejudices if they do not stand up to sceptical consideration.